I had another week when I had almost decided not to post anything. Everything I made on the weekend turned out okay but not great. Then daylight savings ended and it got dark earlier and became more difficult to make something and photograph it before the light faded, and so it went on and on until the thought of making anything for dinner, let alone writing about it, became too difficult. Then I thought: ‘bugger it, I’ll post a recipe for spinach dahl and be done with it’, then I starting doubting again. 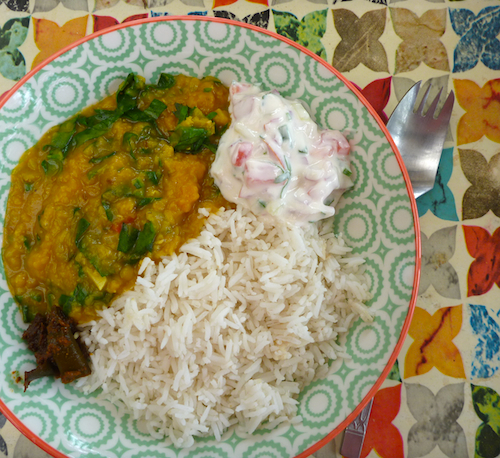 I mean, spinach dahl – how ordinary can you get! That’s what happens when you read too many food blogs with glamorously photographed food. It skews your perceptions of what you think you should be eating. I know a few vegetarians who don’t eat dahl and rice on a regular basis but I don’t know how they manage really. Dahl and rice is a meal you can throw together quickly when your cupboard is almost bare because, if you’re a vegetarian, you always have some form of lentils and rice in your cupboard. 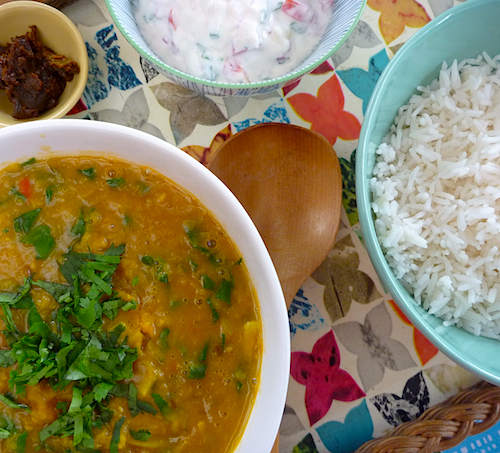 Dahl and rice is like the sausages and mash of the vegetarian world. It is the ultimate in comfort food. Spinach dahl is even better because you’ve got your greens, protein and carbohydrate all in the one bowl. The great thing about Indian food is you can start with something as simple as dahl and rice, keep adding dishes until you have as lavish a feast as you could possibly want, but in the end, dahl and rice is all you really need. I always have some kind of yoghurt and pickle with my dahl and rice, just to lift it out of the ordinary. If I’m not making an extra vegetable dish, I’ll make a simple yoghurt salad, as I did this time with finely chopped cucumber, red onion , tomato and coriander dressed in yoghurt seasoned with salt and pepper. If you wanted to get fancy, you could season the yoghurt with some fried curry leaves, chilli and mustard seeds. But who wants to get fancy on weeknight when the cupboard is almost bare. This dahl is very simply spiced with a cumin and garlic infused oil, but you can experiment with different spice combinations if you like. You can use any kind of greens or spinach – kale, silverbeet, red Indian spinach – even frozen spinach is perfectly fine. I like a very high ratio of spinach to dahl but I usually hold back because my son won’t eat it if it is too spinach-y, but really you can have as many greens in your dahl as you think it can bear. Sort through lentils for dirt and stones and rinse well. Place in a pot with 4 cups of water and ginger slices and bring to a boil. 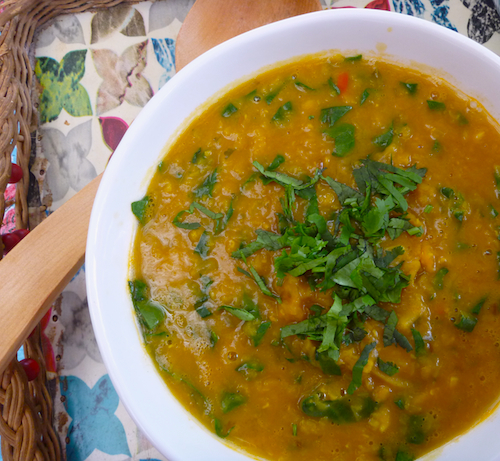 Skim the froth off the top of the lentils, reduce to a simmer and add tumeric. Simmer for about 20 minutes until lentils are cooked. You may need to add more water. The thickness of the dahl is a matter of taste but it will thin out slightly when you add the spinach. When the lentils are cooked, fish out the slices of ginger and add salt to taste. Put in the spinach and cook until it has melted down. Put the lid on the dahl and set aside. Heat oil in a small pan. Add chilli, let sizzle for a couple seconds, then add cumin and then garlic fry until the garlic just begins to colour and then pour the oil and seasoning into the dahl, stir through once then replace lid and let spices meld. Serve dahl hot with rice or chapatis, yoghurt and pickle. Serves 3–4 people depending on appetites and sides offered. Oh I love Spinach Dal it is my favorite, so healthy and nutritious. You can also try Toor or Chana dal next time and it gets a different taste. I ofcourse love to have my Dal with a dollop of Ghee 😉 Love your post you made it look so simple and easy. I’ll have to try some of the delicious dals on your site as well. 🙂 do try and let me know.